It's that time of year. 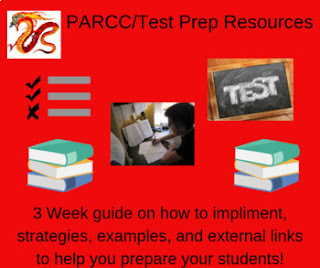 Yes folks it is the season for PARCC, state testing, and high stakes testing. It's the time of year where educators are prepping kids for tests upon their knowledge of reading, writing, and math skills. Educators are consistently trying to prepare the kids with acronyms to help them see success, give them formulas, tables, and many other strategies. I have for years been looking for that "silver bullet, the Holy Grail, Mount Olympus," or whatever you wish to call it. However I still am in the same boat with all of us and I sometimes feel that I do not have even an oar in the water. However what has this lead me to...many resources that I can pull from that have been generated to help out the kids. I even have a 3 week bootcamp to help you plan out how to prepare for all of this testing. You can obviously change the dates however you wish to fit your school system. However these resources will hopefully make you feel a little more sane during this time of crazy schedules, testing boxes, and concern of testing violations. I have this product for sale on my Teachers pay Teachers account and here is a link so you can see a few examples of my product. I also put a preview up of my calendar so that you can see the pacing with all of the potential options. Obviously you can see that they are many options for you. All of which are included in the zipped folder you would receive. Every file is a PDF. There are also fun options for the kids of kahoots or quizizzs that I have made for the students. These should help you to keep the kids engaged as well. If any of you feel like me this time of year makes all of us just feel very overwhelmed so I hope that you will consider saving yourself some of the struggles by having this option handled for you. In sharing this product with my colleagues I know that they have felt much more at ease and it is one less struggle when lesson planning of coming up with a PARCC/test prep warm up or activity for the day. If you have any questions or comments about the product or what might be included feel free to comment or even ask a question in my TpT store. I also have many other products for sale that might be beneficial to helping you after testing season in preparation for final exams or your early planning for next school year.